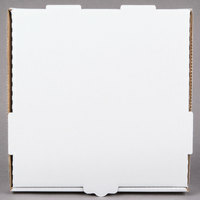 Use our plain pizza boxes as take-out containers at your pizza parlor so patrons can carry their orders home without worrying about them losing their freshness and great taste. Because they're made of thick cardboard, grease and oils won't leak through the bottom either. 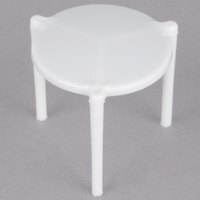 Choose from different sizes to accommodate personal portions to extra-large pizza pies. 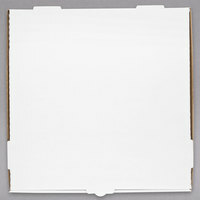 In addition to pizza, our white pizza boxes work well for transporting baked goods such as iced cookies, muffins, and cupcakes. Also make sure to check out other great items from Choice, Bagcraft Papercon and LBP. 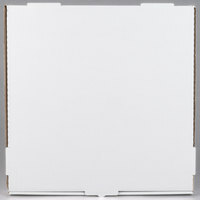 Deliver pizza easily and efficiently with our selection of unprinted pizza boxes. 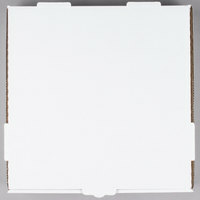 You can write on these boxes with marker to label the size of the pie or the types of toppings on your pizzas, thanks to their plain white construction. 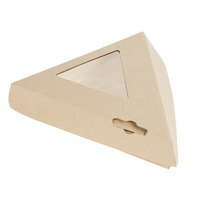 Or, use a stamp to add your logo to the top of each box for a personalized touch. 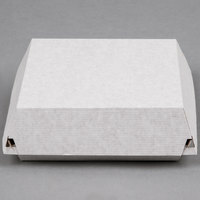 Since they're made of corrugated cardboard, these boxes are also durable, lightweight, and easy to carry. Be sure to check out our selection of wax paper, pizza stackers, and pizza delivery bags for all your pizza take-out and delivery needs. 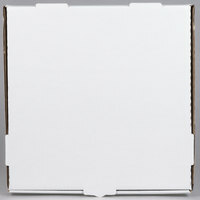 If you're wondering where to buy plain pizza boxes, we have a large selection of plain pizza boxes for sale at the lowest prices.